In 2008 the UK concrete industry agreed a Concrete Industry Sustainable Construction Strategy. The industry pledged to deliver a range of sustainability objectives, and this commitment was signed by trade associations and companies and included the commitment to publish an annual report on the sustainability performance of the industry. The individual sectors and companies had already established initiatives and reporting structures. The commitment to a comprehensive industry strategy and report has required coordination, and further development of sector and company processes. In March 2010 the industry published its second report: 2008 performance data and release of 2012 performance targets. A third report, published in November 2010 shows progress towards the vision is being demonstrated by: Exceeding the government target on responsible sourcing; Exceeding UK average reduction of greenhouse gases; Exceeding energy performance targets; Stakeholder Engagement Survey launched. 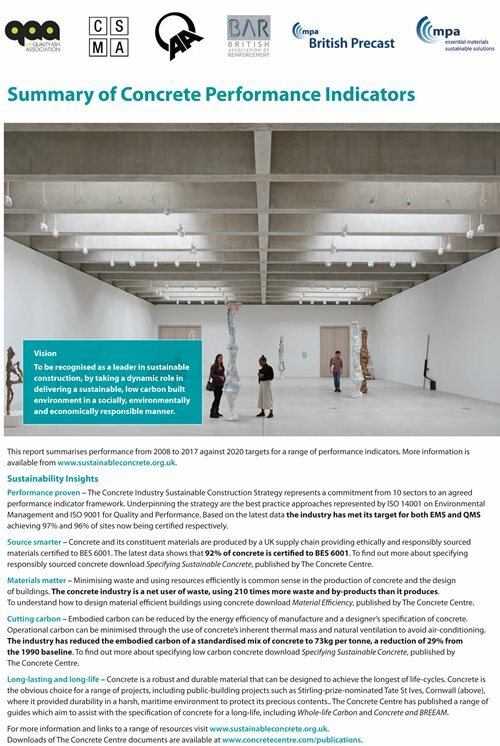 In October 2011, the fourth report was published and it presents the concrete industry's sustainability performance in 2010. The British Association of Reinforcement signed up to the strategy and this report includes performance data from this sector. We will continue to further develop and refine the reporting framework across our industry. We are also increasing the scope of the industry captured by the reporting. In November 2012, the fifth report was published. The data covers the manufacture of concrete and its constituent materials. The information is collected through survey responses from companies supplying an estimated 79% of concrete used in the UK. October 2013 saw the launch of the sixth report. This report includes data and results of targets set for 2012 as well as a look ahead with the publication of 2020 commitments and targets. The seventh report was published in December 2013 and launched at Ecobuild 2015. This report uses the 2013 data. The eighth report was printed and launched at Ecobuild 2016. The industry published its ninth report, with 2015 data, which was launched at Ecobuild 2017. 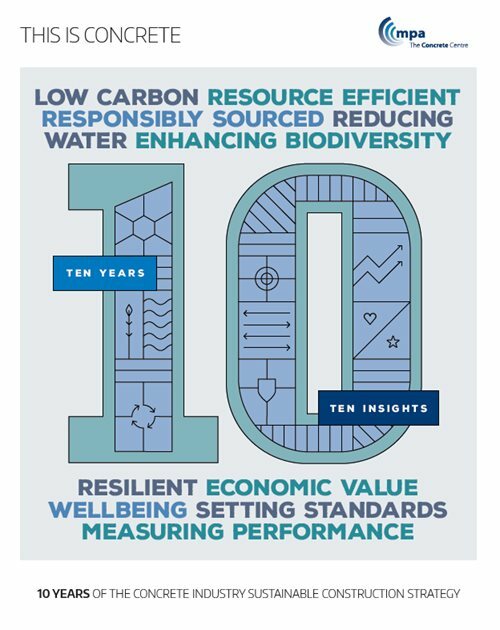 In 2018, the industry celebrated 10 years since the launch of the Concrete Industry Strategy, and its annual Performance Report, with the publication of This is Concrete: Ten Years, Ten Insights.